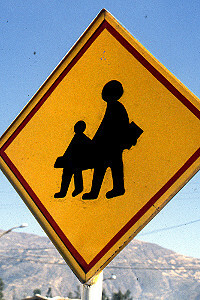 The first two pictures are typical for Peru and its neighbours who share more or less the same design of Children's Crossing Signs ( e.g. 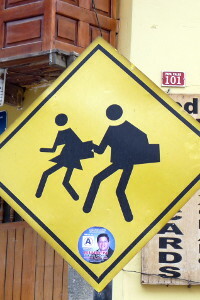 Chile, Ecuador, Bolivia). The only difference is that on most panels the Peruvian drawing is a bit more dynamic: the children are ready to go. Elsewhere it looks like they are just waiting; for the schoolbus maybe? 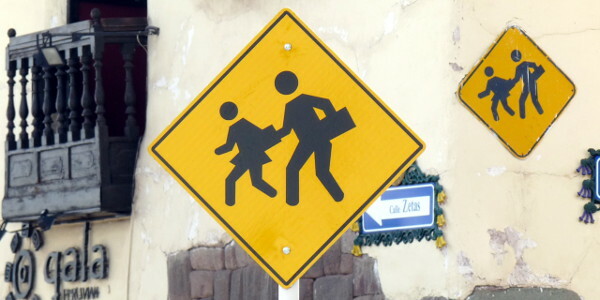 Other countries in South America prefer a similar drawing were grown-ups are shown (e.g. Argentina, Brazil, Venezuela). The next sample shows children wearing a cape (?). It brings Argentina to the mind: it is probably an exaggeration of the dust coat. 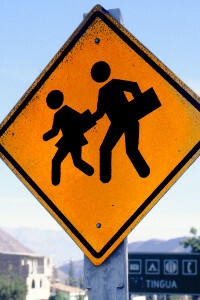 Notice that the book­bags are held at the outside (before and after). Normally both pupils are holding their bag behind their back. 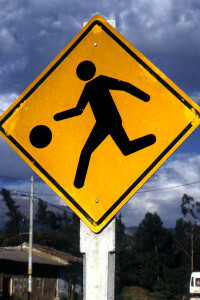 Chile has a very nice sign with a boy playing a ball. It's therefore hardly a surprise that Peru took the mediocre kind of Canada as an example. Ugly always wins.